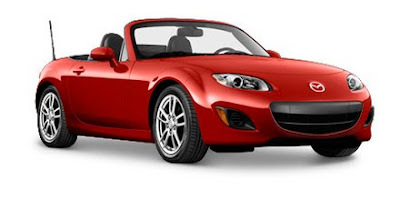 The 2010 MX-5 MIATA is a 2-door, 2-passenger convertible sports car, available in 5 trims, ranging from the Sport to the Grand Touring Power Retractable Hardtop. Upon introduction, the Sport is equipped with a standard 2.0-liter, I4, 167-horsepower engine that achieves 22-mpg in the city and 28-mpg on the highway. A 5-speed manual transmission with overdrive is standard. The Grand Touring Power Retractable Hardtop is equipped with a standard 2.0-liter, I4, 167-horsepower engine that achieves 21-mpg in the city and 28-mpg on the highway. A 6-speed manual transmission with overdrive is standard.